Taus Makhacheva, Baida, 2017. 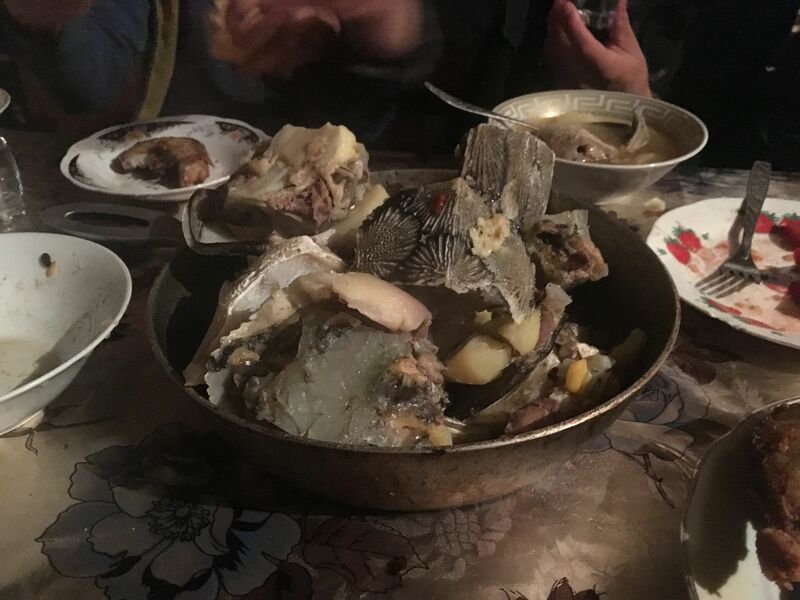 First research trip, sturgeon heads from ukha (fish soup). Dinner with fishermen, July 2016. While conducting research in the Starii Terek village, the artist noticed a recurrent motif in the fishermen's stories: the risk of being lost at sea and never being found. The work is a comment on the precarity of human life and struggle to survive against overwhelming economic and natural forces. narrative projects is pleased to present BaidÀ a second solo exhibition by Taus Makhacheva at the gallery. The exhibition developed from research the artist conducted when visiting different fishermen living in the Starii Terek village in Dagestan and working in the Caspian Sea, and her later investigations into fine art restoration and preservation techniques. When having conversations with the fishermen, Makhacheva noticed a recurrent motif in their stories: the risk of being lost at sea and never being found. The work is a comment on the precarity of human life and the struggle to survive against overwhelming economic and natural forces. The artist looked at these stories through a prism of her own experience of the art world, which resulted in Baida (2017), a video/performance work scripted by performance-maker Tim Etchells and commissioned by the 57th Venice Biennale. Russian slang for a not entirely believable, nonsense story. A fishing vessel, a self-made wooden boat with one or several outboard motors. Since the 1990s, it has spread to the northern Caspian for poaching sturgeon.